Valentine’s Day is tomorrow, so that means I had to share something sweet with you guys today. While most people think of champagne and chocolate, and other caviar tastes – I can’t help but love the simpler things on Valentine’s Day. We always stay at home, and I make a heart-shaped meatloaf. That’s a tradition we always had in my house growing up, and it’s a fun one to be able to pass down to our boys. And, we all look forward to opening our family Valentine Box – a box that’s been decorated with paper, heart doilies, and stickers. A slot is cut through the top to deposit cards, little gifts, boxes of chocolate, etc. It’s something I always really looked forward to as a little girl, and Andrew really seems to be digging it too! He is also really digging all the parties he’s been having at school in the past couple months with all the holidays and whatnot. He’s got a Valentines Day party at school on Thursday, and we’re trying to figure out what to send in to share with the class. 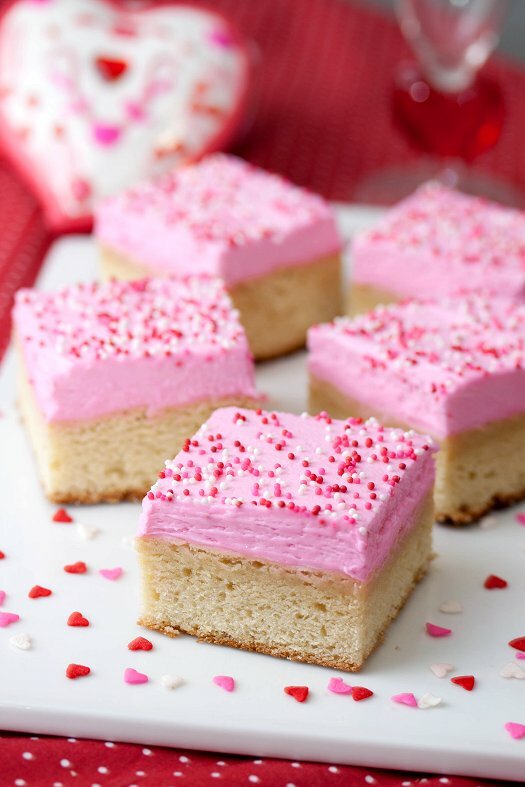 These sugar cookie bars are a top contender! I mean, could they be any more festive? They’re delicious too – denser than a cake, but fluffier and cakier than a cookie. They take a few minutes to throw together, and the batch feeds an army – which is always good when feeding an entire class. If you’re looking for a last minute sweet idea to send in with your little one, these will not disappoint! And, with a different food coloring – could be perfect for so many different occasions. Cream butter and sugar until fluffy. Add eggs, one at a time, mixing well after each addition. Add vanilla and mix well. In a separate bowl combine flour, salt, and baking soda; stir with a whisk to combine. Add to wet mixture and mix just until combined. Spread on a greased baking sheet (use a 13 x 18 pan), using clean wet hands to press the cookie dough down. Bake at 375 degrees for 15 minutes, until light golden brown or until a toothpick comes out clean. Cool completely before frosting bars. For the frosting, beat butter until smooth and creamy. Add vanilla and salt. Add powdered sugar in 1 cup increments until combined, then add milk and mix until smooth and spreading consistency. Add food coloring if desired. Spread over cooled bars using an offset spatula, and cut into squares for serving. Beautiful! I bet Andrew’s classmates would love these! Pretty bars, perfect for Valentine’s! I love the heart-shaped meatloaf idea! And the Valentine’s box idea! And these bars are gorgeous! i always wanted to make these. yours look yummy! Nice recipe and great photo. I’m in Australia and would love to make these, just need some help….. What sort of flour (plain or self raising) and does anyone know our equivalent of powdered sugar? Is that Icing sugar? Thanks in advance, yum! Kacey, plain all purpose flour. And confectioners sugar and icing sugar are the same thing. Enjoy! These look SO fabulous! Can’t wait to try!